STEP TWO: Wait for the TD Niagara Jazz Festival to confirm that they have received your submission. STEP FIVE: All finalists will be contacted to schedule their performance during the FINALS at Vieni Estates Sparkle Fest on Sunday, June 23rd, 2019. All finalists will receive cash prizes. 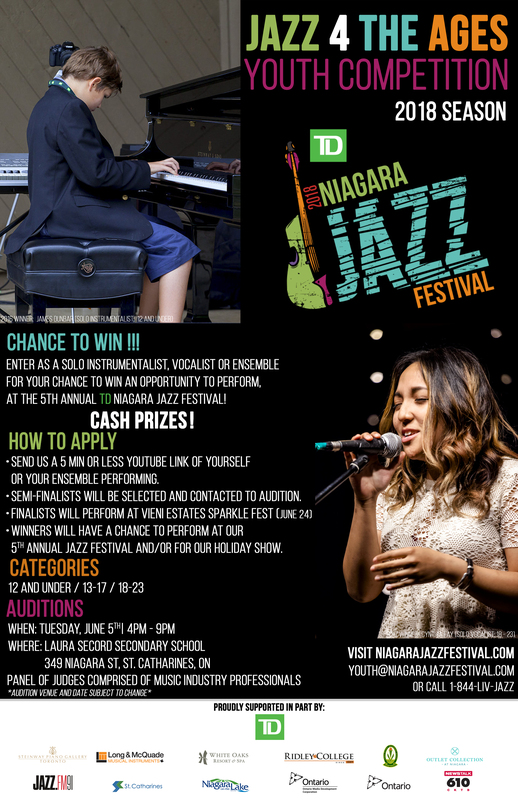 STEP SIX: All winners will be announced at the end of the day at Vieni Estates Sparkle Fest on Sunday, June 23rd, and will be asked their availability to perform at the 6th annual TD Niagara Jazz Festival. (Festival weekends: July 18 – 21 and July 26 – 28) CLICK HERE to see last year’s winners and finalists. Participants will be asked to perform two pieces (3-5 minutes max) and soloists will have the opportunity to sit in with a professional jazz rhythm section. * The TD Niagara Jazz Festival would like to thank the City of St. Catharines and Laura Secord Secondary for their support with this program.